My name is Andrew Coe and I am registered as an approved electrician with full City and Guilds qualifications including the most recent editorial, the certificate for the 17th Edition Wiring Regulations. A C Electrical was established in 2010 as I found customer service lacking in some company's I had previously worked for. I have 15 years experience working on installations of all types including domestic and commercial. I am also registered with the NICEIC (National Inspection Council for Electrical Installation Contracting) as a domestic installer and am able to issue certificates for all part P work carried out. 1, Prompt and polite. 2, Very clear and detailed quotation. 3, Work completed on time. 4, cleared up after work. 5, Work carried out to a high standard, and clearly explained. Andrew moved two electrical plug sockets. The work was very satisfactory & was done exactly to schedule & budget. It was a pleasant experience. Quick and very efficient. Would recommend. Andrew is a great worker, i'm really happy that I chose him. He was on time and done a fantastic job everyday. Very polite and great to have around. I would highly recommend him to anyone and would call him for future jobs! Andy has always been very punctual and works steadily to complete the work. He finished the job to a very high standard. We have used him on several occasions and will use him again. Andrew sorted out a number of electrical jobs for me, including fitting a new consumer unit, adding a new supply for the cooker, fitting an extractor fan in the bathroom and updating all of the light fittings. I am very happy with the work he completed & I found him to be a trustworthy, conscientious, pleasant and professional. I would definitely use him again and recommend him to others. Our flat had a lot of surface mounted power sockets and lighting cable external to the ceilings. It required a full rewire. A C Electrical (Andrew) carried out this task in a proficient and professional manner within the estimated time scale and within budget. 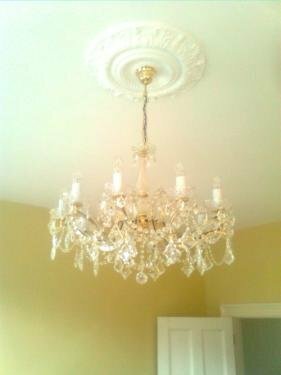 We are very pleased with the completed electrical installation and would recommend A C Electrical without hesitation and would certainly use again should the occasion arise. I found AC Electrical highly efficient. Andrew made contact to confirm the visit and came when he said he would. His work was thorough and he discussed other options for my kitchen lighting. Excellent service and a nice friendly guy. Very professional - reliable and would recommend his services. Andy was very efficient and worked quickly and tidied up after himself. Was very clear about what needed doing and was up front about what the job was going to cost and how long it would take. I would recommend him.